Dragon Age 2' DRM system is nowhere near "draconian," but you will need an internet connection for at least some of the time. If you're planning to buy Dragon Age 2 for the PC, you've got two different versions you can choose from: the version with the simple DRM, or the version with the slightly confusing, but not especially troublesome DRM. BioWare's community manager Chris Priestly outlined the two versions of Dragon Age 2's DRM on the official forums. If you're buying the game through Steam, then you've got nothing else to worry about, as BioWare is letting Valve's systems handle everything. Downloads from other providers, however, as well as the retail versions, have a slightly more involved security system. Players will be able to install the game on as many computers as they like, but no more than five machines can be used to play the game in a 24-hour period. The only part that might prove to be problematic for people is that every installation will require an online verification, and the game will periodically perform a login check. BioWare said that it hadn't decided how frequent those checks would be, but assured people that it will run on even the slowest connections, and that players will not be required to be online all the time. BioWare's Fernando Melo also said that there were sunset plans for the online authentication, so there would never be a case where you couldn't play a legitimate copy of the game. As DRM goes, this is probably one of the most forgiving and light systems around. Obviously, it's not ideal - no DRM system ever is - but BioWare does seem to have gone to some effort to ensure that it's as unobtrusive as possible. 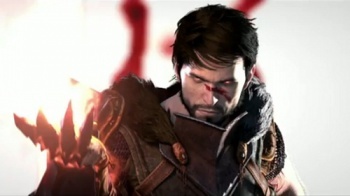 Dragon Age 2 comes out for PC, PS3, and Xbox 360 on March 8th in North America, and on March 11th in Europe.